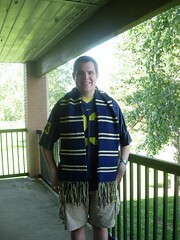 I managed to finish J's scarf in time for him to not wear it to the game out in the hot sun, but we snapped some pictures anyway. And yes, despite the whuppin we took this weekend... GO BLUE! Pattern: Based on Harry Potter patterns I had read but at the time I cast on I just guessed. Shades of Harry Potter! That is a beautiful scarf. 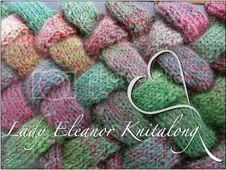 Is it stockinette, rib?? Inquiring minds. very cool Kate ! I'm sure J LOVED it! wow... you Michigan fans better be tough this year.... looks like it might be a rough year... maybe you can beat ND... they are 0-2 too!! Good luck! I'll be watching!! I don't like the whole town being sad after Saturdays! !